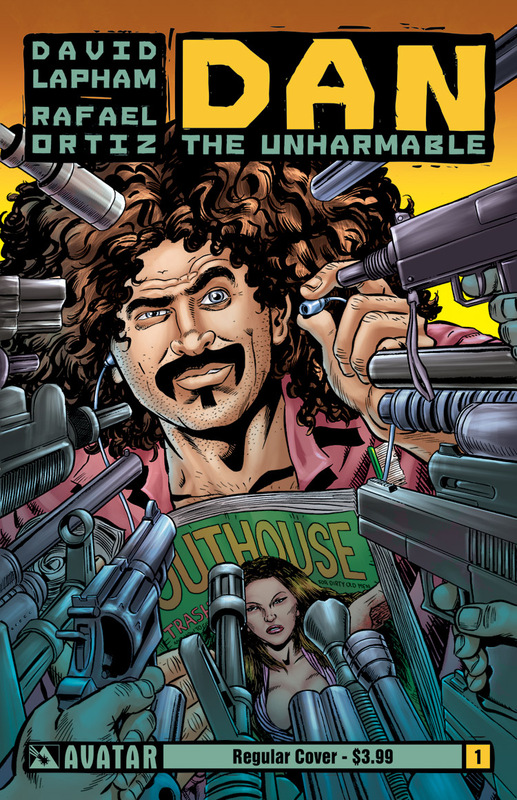 Dan the Unharmable (Avatar) marks David Lapham’s return to crime comics. Lapham revolutionized the genre during the nineties with Stray Bullets, melding the twist-heavy plots of classic series such as Crime Does Not Pay and Shock Suspense Stories with his own particular brand of black humor. 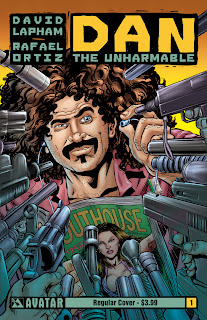 Dan the Unharmable combines this offbeat approach with a touch of equally offbeat superheroism. You see, our hero has powers, hence the “Unharmable” moniker. Think The Big Lebowski meets Unbreakable. With a weird California cult thrown in for good measure. Dan -- “just Dan” -- is a homeless, Melvins-loving, low-rent Philip Marlowe who is invulnerable to physical harm. And not only can Dan take a beating, but he can dish one out with gusto. Since he’s psychologically as well as physically invulnerable -- nothing freaks him out, other than damage to his “almost autographed” Prick CD -- he’s got no qualms about killing people in fairly creative and gory ways. Gore seems likely to be a regular feature of the book. There’s the corpse reminiscent of the Black Dahlia, a dude getting punched through his junk, a disemboweled simpleton, and a Greyhound bus used as a weapon of mass murder. And that’s just the first two issues. The story revolves around the murder of a woman in the Hollywood Hills. The victim’s daughter travels across country to enlist Dan in investigating the case, not because of Dan’s skills at detection -- which appear minimal -- but rather because she may be the daughter of Dan and the murdered woman. Dan, though, is not sure of the truth of the young woman’s claim because he simply doesn’t remember much of his past. But for $170 and a bus ticket to the West Coast, Dan decides to take the case. When a couple of sociopathic cult members from La La Land show up to retrieve the girl, fun sh*t ensues. Dan the Unharmable is Lapham doing what he does best: stories about oddball characters getting themselves into bizarre though not entirely unbelievable situations. Almost unbelievable situations, perhaps. Dan is equal parts silly and disturbing, the dialog crisp, and the black comedy actually funny. Rafael Ortiz’s artwork perfectly complements Lapham’s plot: it’s simple and direct, in line with the Steve Dillon-like comic realism that seems to be Avatar’s penchant. Unlike company mates such as Jacen Burrows and Javier Barreno, Ortiz eschews grit and keeps it light. His attention to comedic facial expressions and expressive body language perfectly complements Lapham’s witty dialog and the post-hippie feel of the book. Even the villains are drawn with a certain exaggerated silliness that works as nice foil to their shear brutality. The only problem I had with the book is that Lapham’s Dan is too much like Lebowski’s the Dude. But I’ll forgive this, if only because Dan’s hazy past may hold enough secrets for some interesting character development. The fact that Dan can’t remember much that happened prior to 2005 suggests that his origin story -- i.e., how the f*ck did he get his powers? -- may become a significant feature of the series. I’m on board, Mr. Lapham. For the long haul.